A Palestinian civilian succumbed to his wound while participating in a protest organized in Zikim” military base. 100 civilians, including 29 children, 3 women, a journalist, and a female paramedic, were wounded. 9 civilians were wounded in the West Bank. A Palestinian civilian were killed and a child was wounded near a military checkpoint in the northern West Bank, under the pretext of throwing a homemade pipe bomb at the soldiers. 7 Palestinian civilians, including 2 children, were wounded in separate incidents in the West Bank. Israeli forces conducted 79 incursions into Palestinian communities in the West Bank and 3 limited incursions in the Gaza Strip. 56 civilians, including 14 children and a woman, were arrested in the West Bank. 5 children were arrested while sneaking into Israel, east of the Gaza City. 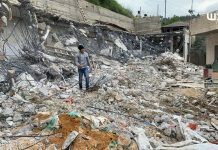 2 civilians were forced to self-demolish their houses in Silwan village and al-Mokaber Mount. A road connects between al-Masafer area in Yatta and Kherbit Sha’b al-Baten, south of Hebron, was leveled. 23 olive seedlings were uprooted in eastern Yattam south of Hebron. 2 shooting incidents were reported against the fishing boats in the sea. 103 permanent checkpoints, 62 temporary checkpoints and 14 closed roads obstruct the movement of Palestinian civilians in the West Bank. 6 civilians were arrested at the military checkpoints in the West Bank. Israeli violations of international law and international humanitarian law in the oPt continued during the reporting period (31January- 06 February 2019). At approximately 01:00, Israeli forces moved into Beit Ummar village, north of Hebron. They raided and searched a house belonging to Jehad Mohammed ‘Odah ‘Alama (23) and then arrested him, taking him to an unknown destination. Around the same time, Israeli forces moved into Beit Kahel village, northwest of Hebron. They raided and searched a house belonging to ‘Abd al-Mahdi Mahmoud Zhour (39) and then arrested him, taking him to an unknown destination. Around the same time, Israeli forces moved into al-Khader village, south of Bethlehem. They raided and searched houses, from which they arrested Ahmed Mohammed Salah (24), Mohammed Khader Moussa (27), Zain Mohammed ‘Issa (21), and Youssof Tayseer ‘Issa (20). At approximately 02:00, Israeli forces raided and searched a house belonging to ‘Ali Abu Rajab (50) in al-Sahla area in the center of Hebron’s Old City. They then locked all the 14 family members in a room. Moreover, the Israeli soldiers confiscated a car under the pretext of checking purposes, and no arrests among the family members were reported. It should be noted that around 50 Israeli settlers, under the Israeli forces’ protection, raided the house of Abu Rajab Family on 25 July 2017. They holed up in the house and raised Israeli flags on its roof. The settlers said that they entered the house under the pretext of buying it from its owners, whereas the family denied their claims. After raiding the house, it became under the settlers’ control. It should be noted that the settlers live in the second and third floors of the 3-story house while Abu Rajab family lives in the first floor. At approximately 03:40, Israeli forces moved into al-Shorfa neighborhood in the center of al-Bireh. They raided and searched a house belonging to Adam Hesham al-Shafe’y (17) and then arrested him, taking him to an unknown destination. A 19-year-old male was wounded to the right leg. The wounded civilians were then taken to al-Mizan Hospital in Hebron and al-Hussain Hospital in Bethlehem to receive treatment. Doctors classified the injury of one of them as serious. Note: During the aforementioned day, Israeli forces conducted (3) incursions in the following areas and no arrests were reported: Yatta; al-Samou’a and Beit Marsam villages in Hebron. At approximately 01:30, Israeli forces moved into Kafrdan village, west of Jenin. They raided and searched a house belonging Maher Tahseen ‘Abed (36) and then arrested him, taking him to an unknown destination. At approximately 03:00, Israeli forces moved into al-Dhaisha refugee camp, west of Bethlehem, and stationed in al-‘Arajma neighborhood. They raided and searched a house belonging to Ibraheem Mustafa Ibraheem al-Masri (49) after breaking the main door of the building, where he lives. After that, The Israeli forces locked Ibraheem’s family members in one room and confiscated 3 hard disks, a laptop, a tablet, and 3 mobile phones. This incident came after 14 hours of arresting Ibraheem’s son Ahmed (20) at a temporary checkpoint on “Ma’aleh Adumim” settlement’s road, east of occupied East Jerusalem, while he was on his way back to home from the university in Ramallah. At approximately 02:30, Israeli forces moved into Tulkarm refugee camp adjacent to Tulkarm. They raided and searched a house belonging to Samed Fayez Mohammed Abu Sfaira (22) and then arrested him, taking him to an unknown destination. At approximately 07:00, Israeli forces backed by military vehicles, moved around 100 meters into the east of al-Qarara village, north of Khan Younis, south of the Gaza Strip. The military vehicles started to level lands to the south of the border fence with Israel. They then redeployed along the border fence, adjacent al-Fraheen neighborhood, east of Abassan al-Kabeera village. Note: During the aforementioned day, Israeli forces conducted (7) incursions in the following areas and no arrests were reported: Habla village, southeast of Qalqilia; Beit Foreek and ‘Otra villages, east of Nablus; Hebron, al-Shayookh, Deir Samet and Abu al-‘Asja villages in Hebron. At approximately 08:00, Israeli forces stationed along the border fence with Israel, east of Deir al-Balah in the central Gaza Strip, opened fire at agricultural lands. The Israeli shooting recurred at approximately 16:00, so the farmers were forced to leave the area, and no casualties were reported. At approximately 09;00, Israeli gunboats stationed in the sea, west of Khan Yunis, south of the Gaza Strip, opened fire at Palestinian fishing boats sailing within the allowed fishing area and chased them, causing fear and panic among Palestinian fishermen. As a result, the Palestinian fishermen fled for fear of their lives and no casualties or damages to the boats were reported. At approximately 10:00, Israeli gunboats stationed in the sea, west of Rafah, south of the Gaza Strip, opened fire at Palestinian fishing boats sailing within 3 nautical miles and chased them, causing fear and panic among Palestinian fishermen. As a result, the Palestinian fishermen fled for fear of their lives and no or damages to the boats casualties were reported. Note: During the aforementioned day, Israeli forces conducted (5) incursions in the following areas and no arrests were reported: Dirsitiyia village, northwest of Salfit; ‘Aazmout village, east of Nablus; Dura City; and Sa’ir and Beit Ummar villages in Hebron. At approximately 01:00, Israeli forces moved into al-‘Aroob refugee camp, north of Hebron. They raided and searched houses, from which they arrested Kareem Mussalam Abu Sal (19), ‘Obaida ‘Emad al-Ra’y (22) and Hussain Youssof Jwabra (18). At approximately 01:30, Israeli forces moved into Taqou’ village, southeast of Bethlehem. They raided and searched 2 houses belonging to Mohammed Nayef Abu Mefreh (24) and Mohammed Sulaiman Abu Mefreh (29), and then arrested them, taking them to an unknown destination. At approximately 02:00, Israeli forces moved into Beit Fajar village, south of Bethlehem. They raided and searched a house belonging to Hatem Jaber Dirya (42) and then arrested him and his two sons Youssof (17) and Moussa (15), taking them to an unknown destination. Around the same time, Israeli forces Senrya village, west of Qalqilia. They raided and searched a house belonging to ‘Othman Ahmed Ibraheem Omar (35) and then arrested him, taking him to an unknown destination. At approximately 07:00, Israeli forces stationed along the border fence with Israel, east of Shwakah village, east of Rafah, south of the Gaza Strip, arrested Qussai Fayez Moussa al-Soufy (15), Madah Fawzy Moussa Abu Snaima (17), Taha ‘Abd al-Hady Shaty al-Sody (14), Zeyad Yossry ‘Eid al-Bahabssa (15), and Ibraheem Mohammed Merssal Shalhoub (17). At approximately 07:20, Israeli forces stationed along the border fence with Israel, east of Shawkah village, east of Rafa, south of the Gaza Strip, opened fire at agricultural lands and no casualties were reported. 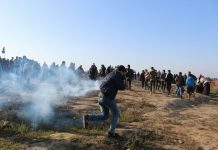 At approximately 07:30, Israeli forces stationed along the border fence with Israel, east of al-Nusairat refugee camp, sporadically opened fire for around an hour at agricultural lands. As a result, the Palestinian farmers were forced to leave the area, and no casualties were reported. At approximately 14:00, Israeli forces moved into Eastern Laban village, south of Nablus, in order to carry out an arrest campaign in the village. A number of civilians gathered and threw stones at the military vehicles. After that, the Israeli forces immediately fired rubber bullets and tear gas canisters at them. As a result, an 18-year-old child (18) was wounded with a rubber bullet to the right foot and then taken to Yasser ‘Arafat Governmental Hospital in Salfit, where he received 8 stiches. At approximately 16:30, Israeli forces moved into Kherbet Um al-Jammal in the northern Jordan valley. They raided and searched a house belonging Nemer Mahmoud Erheel Ka’bana (20) and then arrested him, taking him to an unknown destination. Note: During the aforementioned day, Israeli forces conducted (7) incursions in the following areas and no arrests were reported: Kafur Qadoom village, northeast of Qalqilia; al-Jadida and al-Zababda and ‘Aaqaba, southeast of Jenin; and Bani N’aim, Beit Ummar, Deir al-‘Assal al-Foqa, and al-Daheria villages in Hebron. At approximately 01:00, Israeli forces moved into ‘Izbit Mas’oud area, north of Aktabah suburb adjacent to Tulkarm. They raided and searched a house belonging to Belal Mohamed ‘Abed al-Jawwad “Shaiekh ‘Abed” (26) and then arrested him. At approximately 02:00, Israeli forces moved into Jenin. They raided and searched houses, from which they arrested 3 civilians, including 2 children. They arrested civilians were identified as Mohamed Naseef Ghawadrah (23), Thaier Hussain Sa’ieed ‘Asas’ah (17) and Rami Saleem Mer’I (17). The Israeli forces also confiscated a motorcycle belonging to Ibrahim Hussain Mer’i. Around the same time, Israeli forces moved into Jenin Refugee Camp, west of Jenin. They raided and searched houses, from which they arrested Mahmoud Samer Jabareen (25) and Mo’min Abu Hamadah (19). Around the same time, Israeli forces moved into Irtah suburb, southwest of Tulkarm. They raided and searched a house belonging to a former prisoner Monther “Mohamed Mansour” ‘Abed al-Kareem ‘Ashour (34) and then arrested him. Around the same time, Israeli forces backed by military vehicles and mounted-crane trucks moved into Tulkarm from the western side. The Israeli forces headed towards al-‘Awda Street, west of the city. They then raided al- Lubaddi garage for repairing vehicles and confiscated a number of vehicles’ engines and automotive parts in addition to other vehicles. The Israeli forces arrested 3 civilians while they were in the shop. The arrested civilians were identified as Ahmed Mohamed Ahmed Hamdan (34), the shop’s owner; ‘Izzat Makawi Tawfiq Shadeed (39); and ‘Adnan ‘Abed al-Raheem Jallad (52). In the meanwhile, another Israeli forces raided a house belonging to Khair Allah Mahmoud Shaf’i (59) and arrested him. Four hours later, the Israeli forces withdrew from the city and took the arrested civilians to an unknown destination. On the same day evening, the Israeli forces released Khair Allah al-Shaf’i. Around the same time, Israeli forces backed by military vehicles moved into al-Walajah village, northwest of Bethlehem. They deployed between houses and combed lands. They then arrested Foad Mohamed al-A’raj (16), taking him to an unknown destination. At approximately 03:00, Israeli forces backed by military vehicles moved into Hebron. They raided and searched 2 houses, from which they arrested Meqdad Omar al-Qawasmah (24) and Husam Mahmoud Abu Shkhadim (23), taking them to an unknown destination. Around the same time, Israeli forces moved into Qaddourah refugee camp in the center of Ramallah. They raided and searched houses, from which they arrested ‘Awaad Sameer ‘Awaad (19) and Ahmed Jum’a ‘Awwad (21). Around the same time, Israeli forces moved into ‘Aboud village, northwesr of Ramallah. They raided and searched a house belonging to Ibrahim Mahmoud al-Barghouthi (28) and then arrested him. At approximately 06:45, Israeli forces backed by 4 military vehicles moved around 100 meters into the west of the border fence with Israel, east of Dir al-Balah. The Israeli vehicles levelled and combed lands along the border fence and then headed to the north, east of al-Buriej camp. At approximately 13:30, the Israeli vehicles redeployed along the border fence. At approximately 17:00, Israeli forces moved into an area located on bypass road between ‘Orta and Rojeeb villages, southeast of Nablus, where they set up an ambush. They then arrested 4 children, from Rojeeb village, who were throwing stones at the Israeli vehicles passing through the mentioned road. The arrested children were identified as ‘Obada Mohamed Khaled Rawajbah (17), Khaled Mohamed Rawajbah (16), Nader Saher Hijazi (16), and ‘Abed al-Rahman Khaled Sbitani (17). At approximately 20:00, Israeli forces opened fire at Palestinian civilians, including a child. The civilians were riding a motorcycle at the sub entrance to al-Jamalah village between forest trees and greenhouses, 300 meters away from Jenin- al-Nasserah Street, which leads to al-Jamalah checkpoint, northeast of Jenin. As a result, ‘Abdullah Faysal Omar Abu Taleb (19), from al-Jamalah village, was killed after being hit with live bullets to the head and feet. Moreover, Ahmed Omar Fawzi Abu Hananah (16), from ‘Aranah village, was hit with 4 live bullets to the back, shoulder and leg. Ahmed was taken to Khalil Suliman Governmental Hospital via a PRCS ambulance and his healgh condition was described as stable. The body of Abu Taleb was kept for over an hour in the scene before delivering him to the PRCS ambulance. The Israeli forces claimed that al-Jamalah checkpoint was exposed to throwing a homemade pipe bomb before opening fire at the civilians by the Israeli soldiers. It should be noted that the checkpoint is about 700 km away from the area, where Ahmed wounded and ‘Abdullah killed. There was no eyewitness in the area to refute the Israeli claims, but the soldiers could have used less lethal force towards the male and child, especially that they did not pose any danger to the soldiers’ life. Note: During the aforementioned day, Israeli forces conducted (8) incursions in the following areas and no arrests were reported: Showikah suburb and Far’oun village in Tulkarm; Zababdah and Sanour villages, southeast of Jenin; and Sureef, Dir Razzah and Shayyoukh villages in Hebron. At approximately 01:00, Israeli forces moved into Rojeeb village, southeast of Nablus. They raided and searched houses and then arrested Ameen Farraj (15), taking him to an unknown destination. Around the same time, Israeli forces backed by military vehicles moved into Beit Fujjar village, south of Bethlehem. They raided and searched 2 houses, from which they arrested Mohamed Naser Diriyah (16) and Ibrahim Khalil Diriyah. At approximately 02:00, Israeli forces backed by military vehicles moved into Ethna village, west of Hebron. They stationed in Wad al-Risha area and then raided and searched 2 houses belonging to Abi Jehishah family. They then arrested two siblings identified as Mojahed (33) and Mo’taz (35) Mohamed Abu Jehishah and took them to an unknown destination. At approximately 02:00, Israeli forces moved into Kuber village, north of Ramallah. They raided and searched houses, from which they arrested 4 civilians, including a woman. The arrested civilians were identified as Hamza ‘Awwad al-Barghouthi (28), Zahi Isma’il al-Barghouthi (40) and his brother Saher (35) and his sister Suhair (54). Around the same time, Israeli forces backed by 10 military vehicles moved into Abu Shkhaidem village, northwest of Ramallah. They raided and searched houses, meanwhile, a number of Palestinian young men gathered and threw stones and empty bottles at the soldiers. The Israeli soldiers heavily fired live and rubber bullets at them. As a result, a 23-year-old male was hit with a rubber bullet to the head, and a 20-year-old male was hit with alive bullet to the foot. The wounded persons were then taken to the Specialist Hospital in al-Rayhan suburb, north of the city. The Israeli forces arrested Ahmed Mohamed ‘Abed al-Hafiz (29) and Isma’il Suhail Harb (32), taking them to an unknown destination. They also confiscated 3 vehicles belonging to Ziad Shalaldah, a prisoner at the Israeli jails, Sarhan Mish’al and Isma’il al-Barghouthi. At approximately 02:30, Israeli forces moved into Ya’boud village, southwest of Jenin. They raided and searched houses, from which they arrested 4 civilians, including a father and his child. The arrested civilians were identified as Ahmed Jum’a Ba’jawi (55), Member of Ya’boud Village Council and General Director of Palestine T.V, and his son Zaid (14); Mohamed Bassam Ba’jawi (21) and Mohamed Khaled Murad Jawabrah (19). On the next day morning, the Israeli forces released Ahmed along with his son. At approximately 03:00, Israeli forces moved into ‘Ain Beit al-Maa’ refugee camp, west of Nablus. They raided and searched houses, from which they arrested Mahmoud Samer Jabareen (25) and Mo’min Abu Hamadah (19). At approximately 07:10, Israeli forces backed by 8 military vehicles moved around 100 meters into the west of the border fence with Israel, east of Dir al-Balah. The Israeli vehicles levelled and combed lands along the border fence and then headed to the north, east of al-Buriej camp. At approximately 15:15, the Israeli vehicle redeployed along the border fence. At approximately 08:30, Israeli forces stationed along the border fence with Israel, east of al-Maghazi camp in the center of the Gaza Strip, opened fire at agricultural lands. The Israeli shooting recurred at approximately 11:15, so the Palestinian farmers were forced to leave the area and no injuries were reported. Note: During the aforementioned day, Israeli forces conducted (3) incursions in the following areas and no arrests were reported: Kafur Qaddoum in Qalqiliyia; and Kafur al-Deek in Slafit. At approximately 01:30, Israeli forces moved into Kafur Thulth village in Qaqliliyia. They raided and searched a house belonging to Suhail Subhi Fathi ‘Isaa (36) and then arrested him. At approximately 02:00, Israeli forces moved into ‘Araba, southwest of Jenin. They raided and searched houses and then arrested Ibrahim Mohamed Saleh Dahbour (53), Deputy of Change and Reform Bloc in the Legislative Council. At approximately 02:30, Israeli forces moved into Balatah village,southeast of Nablus. They raided and searched houses and then arrested Habeeb Khaled Suliman (23). At approximately 08:45, Israeli forces stationed along the border fence with Israel, east of al-Maghazi camp in the center of the Gaza Strip, opened fire at agricultural lands. As a result, the Palestinian farmers were forced to leave the area and no injuries were reported. At approximately 21:30, an Israeli tank fired a sell at a military site belonging to the Palestinian armed groups, 100 meters away from the border fence with Israel, east of al-Fakhari village, southeast of Khan Yunis. As a result, the site sustained material damages and no injuries were reported. Twenty minutes later, the Israeli tank fired another shell at another military site, east of the village, and no injuries were reported. At approximately 23:30, the Israeli tank fired another shell at the abovementioned site. The Israeli forces stationed along the border fence heavily opened fire at agricultural lands in the area. Note: During the aforementioned day, Israeli forces conducted (9) incursions in the following areas and no arrests were reported: Qablan village, southeast of Nablus; Safareen and Qafeen villages in Tulkarm; Merda village in Salfit; Qaliqliyia; Abu Qash, Birziet, Western al-Mazra’ah villages, northwest of Ramallah; and al-Jenan neighborhood in al-Birah. On Wednesday, 30 January 2019, the Israeli authorities allowed 5 persons; on Sunday, 03 February 2019, 2 persons; and on Monday, 04 February 2019, one person, who work at the General Authority of Civil Affairs (GACA) and internationals to renew their permits. On Thursday, 31 January 2019, the Israeli authorities allowed 17 farmers to travel via the crossing in order to attend an agricultural training course. On Sunday, 03 February 2019, the Israeli authorities allowed 3 doctors to travel via the crossing in order to attend a medical training course. On Monday, 04 February 2019, the Israeli authorities allowed 6 persons to return to the West Bank. On Thursday evening, 31 January 2019, Israeli forces stationed at al-Karama (Allenby) crossing, arrested Shadi Motawar, Fatah Movement Secretary. Shadi was arrested while returning along with the West Bank Secretaries from a visit to the Palestinian Refugee Camp in Syria via Jordan boundaries. On Sunday, 03 February 2019, the Israeli Court decided to release him on bail after it rejected the appeal filed by the police. The Court decided to detain his passport and identity card for a month then released him. On Thursday evening, 31 January 2019, Israeli forces arrested Ahmad Ibrahim Mustafa al-Massry (20), from al-Dihisha refugee camp, west of Bethlehem. He was arrested at a temporary checkpoint on the road of “Ma’ale Adumim” settlement, east of occupied East Jerusalem, while he was on his way back from Darul Ma’allimeen Institute, where he studies. At approximately 13:30 on Saturday, 02 February 2019, Israeli forces arrested Mohammad Hader al-‘Amour (22), from At-Tuwani village, east of Yatta, south of Hebron. He was arrested in Massafer area and then taken to an unknown destination. At approximately 14:00 on Saturday, 02 February 2019, Israeli forces arrested ‘Abdulrahman Ahmad Eshtewee (20) at a temporary checkpoint that they set at the eastern entrance to Qalqilya and then took him to an unknown destination. At approximately 16:00 on Saturday, 02 February 2019, Israeli forces arrested Waleed Khaleel Abu Jeldah (25), from Qalandia, at Za’tara checkpoint, south of Nablus and then took him to an unknown destination. At approximately 23:00, Israeli forces arrested Akram Nabeel ‘Abdul Fattah Humodah (31), from Showika village in Tulkarm at Za’tara checkpoint and then took him to an unknown destination. At approximately 16:00 on Sunday, 03 February 2019, Israeli forces arrested Mahmoud Manssour Lutfy Hussein (21) when passing through the gate of annexation wall adjacent to Qaffin village, north of Tulkarm, while he was on his way back from an agriculture land, taking him to an unknown destination.